No words can describe the absolute heartache and devastation of the recent fires that affected so many communities along our beloved Garden Route as well as communities close to Port Elizabeth – Thornhill, Longmore, Jeffreys Bay, to name a few – the worst of its kind we have ever experienced and very, very hard to get our heads around – the force of nature vs humankind was overwhelming – lives were lost – for once as humans we had little control over what was happening and unfolding and watched in despair and horror as home after home was engulfed in flames .. BUT, and the most important BUT, it united South Africans from all walks of life that has not been seen since 1994. We stood together to claim our freedom as a people and it took this horrific devastation to prove that we can do it again!! 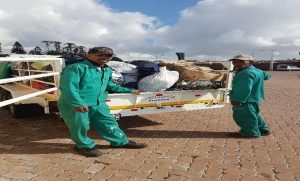 People have been amazing and Ikhala Trust played the conduit role of getting goods out to where it was most needed – but we were completely blown away by the generosity of the Herbert Hurd Primary School here in Newton Park, Port Elizabeth. We often receive donations but this blew our minds – more than 100 black bags of clothing, bedding, food stuff, baby goodies, water, toiletries and the list goes on – we felt like we were in a relief camp and were completely overwhelmed. We bought 70 x 25kg Garden Refuse bags from Builders Warehouse (they ones they use for garden refuse removal) and we filled them all and we still have more. 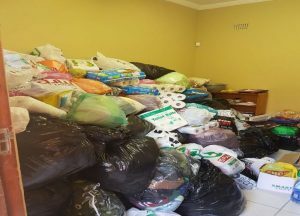 With the permission of the principal at Herbert Hurd – and as the Knsyna Fire Victims depot had been saturated with donations – we asked if we could distribute the donations across the Eastern Cape to impoverished communities who would not otherwise benefit from donations and there was a YES – do what needs to be done and we DID!! Thank you so much Mr Harris and your spirit of giving and involving your school – we feel and continue to feel humbled and thrilled at the same time by the generosity of your school. Words fail us as we continue to distribute bags of clothing, food and other goods to communities and organisations across the Eastern Cape. A real and true UBUNTU experience!! 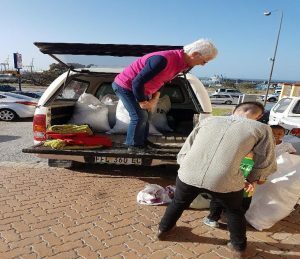 Sr Martha from the Addo community loading bags into her bakkie. They deal with farmworkers and their families in the Sundays River Valley Area who did not have the devastating fires but the terrible disease that affected the Citrus industry. 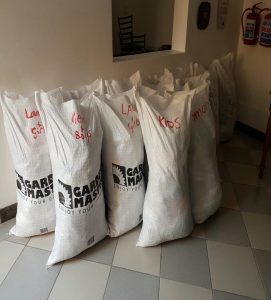 The lessons we take from this experience is that we did not for a minute consider that this is not our core business – we were trusted as an organisation to ACT and ACT we did – two of us sorted and worked through every single black bag and separated the donations into different categories i.e. women, babies, small children, boys and men and no questions were asked – we just got stuck in. Each item that we handled had a special meaning from who ever donated the item/items and that had deep meaning. Our backs were breaking but there was no complaint as we knew WHY we were doing this. Unsuspecting colleagues acted as couriers of the bags to different communities with no complaint. These are some of the bags we packed and distributed and continue to pack bags as more donations continue from Herbert Hurd Primary School and others. Our faith in humanity is restored – we are indeed an incredible nation and people and especially people from Port Elizabeth – we are not just renowned for the Windy City (I beg to differ) but as the most caring and united city in South Africa. For once for approximately a whole week – we did not have to deal with Gupta stories, State Capture, downgrading, but rather involved human beings who CARE and CARE deeply for each other regardless of race, colour, or CREED. We salute you and thank you from the bottom of our hearts for your profound generosity – THIS IS IT WHAT BUILDS COMMUNITIES OF EXCELLENCE! !